This beer is the stickiest of the icky. It's a luxuriously hoppy amber loaded up with intemperate quantities of Nelson, Mosaic, and Simcoe hops, which are some of the fruitiest, dankest hops sweet, sweet money can buy. 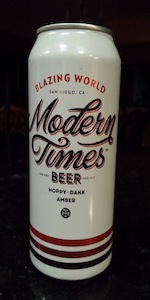 Despite its amber hue, Blazing World is pleasingly dry, sporting a lightly bready malt backbone that serves as platform for the huge & complex hop profile. O: Ambers can often be bland or unremarkable but this was a really good departure from the norm. Great hop aroma but not overly bitter. A balanced and very drinkable beer. I will seek out more of this! Poured from chilled can into tasting glasses. Copper colored, dark pale ale-ish in color with chill haze present. Very fragrant nose, scents of pine, pink grapefruit and tropical fruits; papaya. Taste follows nose with pungent hop flavor dominating. Musky fruit dominates taste as well! Passion fruit, papaya, grapefruit pith, toasty malts in the backbone. Very dry and astringent mouthfeel with lots of carbonation. Very good, very interesting beer that is unique in that it has the hop profile of an IPA with the toasted/caramel grain aspects of an amber, while being very dry. Pouring a mildly hazy amber with a dense, off-white head with excellent retention and lacing, this looks great! The nose is bright, fresh and dank, with a blend of dank weed and citrus pith. While inspired by Nugget Nectar, with the bready, toffee-like note with a hint of caramel present, it does add a unique twist with an oatmeal character that's surprisingly noticeable. Opening with a big, bright and dank pine resin hop blast with moderate grapefruit, candied orange and some weed, this is excellent. An oatmeal-like creaminess is present on the mid-palate, working well with the hops. Also present is a mild sweetness with notes of toffee and brown sugar. Drying on the finish, moderately bitter and plenty pine-y, this beer is medium-light in body, moderately carbonated and thoroughly enjoyable. Excellent stuff. Pours a brilliantly clear dark golden color with a smallish off white head that persists for a little bit. Lots of citrus and pine in the aroma, grapefruit and resinous dankness backed up by a hint of bready caramel. The flavor is lots of juicy hops with some mineral and earthy edges. Citrus and pine flavor are a bit lighter than the aroma suggested. Light bready malt sweetness with a moderate stinging bitterness that lingers long into the finish. Light alcohol sensation, medium body with moderate carbonation. some rough edges here, but I certainly had no trouble finishing 16oz of this.